Throughout the year and especially in the holiday season, there is little we are more thankful for than family. As parents, aunts, uncles, grandparents, and family of the heart, the team at the Brod Law Firm knows that protecting our youngest loved ones is one of our greatest duties and greatest honors. We are proud to serve as an Oakland child injury law firm and we are also dedicated to preventing accidents that hurt young children. One danger that often goes unnoticed until it is too late is improperly mounted and/or unsecured furniture, a danger illustrated in a recent accident at an area preschool and one that everyone who loves a child should know about. This week’s Oakland Tribune reported on an accident that left two youngsters injured at a Fremont preschool. According to police, an improperly-mounted large wall cabinet fell onto two children while they were napping at an unnamed preschool located near Warren Avenue and Warm Springs Boulevard. Fire officials and police responded and found one child, a 3 year-old female, unresponsive. She was taken by helicopter to a children’s trauma center with critical injuries. As of Monday, her status had improved but she remained in the hospital. A second child incurred minor injuries. 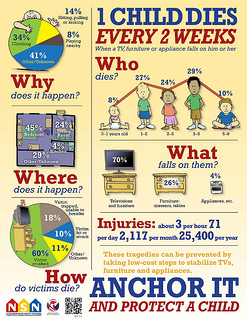 A fact sheet authored by the Child Injury Prevention Alliance, a research group working to prevent intentional and unintentional injuries impacting children and adolescents, includes some surprising statistics on injuries caused by falling televisions and other furniture. Every day more than 40 children visit emergency rooms because of injuries caused by furniture tip-overs. For children under age 10, televisions are the leading culprit while desks, cabinets, and bookshelves cause the most injuries to those between 10 and 17 years old. More statistics are found on the US CPSC poster at left (image link follows entry). In some cases, children too young to appreciate the potential danger either pull the furniture down or are hurt when they try to climb on an item. The Alliance recommends that TVs either be mounted to walls with appropriate brackets or strapped to stands made for the heavy-duty job, preferably a low and wide base with the TV as far back as possible. Other heavy items should be kept on low shelves to minimize danger with large pieces of furniture secured to the wall using L-brackets, safety straps, or other attachments. There are options that do not require drilling holes available for items under 100lbs. Drawer stops should be placed on all drawers to prevent them from falling out onto an unsuspecting child. In addition, adults should try to think of the room from the perspective of a curious child. Avoid placing toys or other items that are likely to attract a child’s interest on high shelving or on top of a television to avoid the risk of the child attempting to climb up to get the item and causing the unit to tumble. Likewise, cords should be tucked away to avoid a child pulling an item down. We hope every parent and caretaker hears about the danger of falling furniture before witnessing it firsthand and that none of our readers ever has to receive the type of phone call that must have gone out to the parents of the two Fremont-area children. We urge that readers in any home or facility that hosts young children take a moment right now to walk around and look for any furniture or other bulk items that could fall over and injure a child. If you find a danger, fix it — do not run the risk of a terrible regret. When a child is injured, medical care (and love!) should be the first concern. Parents or guardians should also consider whether someone may be legally liable for the injuries, especially those that may have long-term impact on the child’s well-being. Was a caregiver negligent? Was a property owner careless? Did a company produce an unreasonably dangerous product? Was someone otherwise to blame? If your child has been injured in the Northern California region, our injury lawyer can help. Call our child injury law office in Oakland, San Francisco, or Santa Rosa to arrange a no-cost consultation. Most injury cases are handled on a contingency basis so you only pay us if you (or your child) recover compensation.